The weather has been so beautiful we played hooky today and drove through Yosemite to take pictures of whatever came our way. It's off season ... most of the fall colors are gone and the snow was patchy. But it was a beautiful day and nothing much more until Coyote came our way. He was at the edge of the road and we stopped hoping to catch a quick photo. 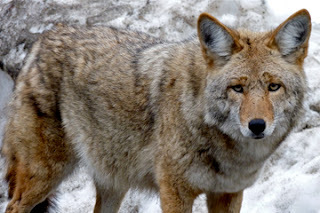 But, he didn't dash away like we expected (coyotes are known for not doing what you expect them to do). He stayed and watched us intently. Maybe he was tourist-wise and expected a handout. Maybe he was old and lazy. Maybe he was just trying to figure us out. Whatever he was thinking, he stayed and stayed as we shot photo after photo. This one is my favorite. Since we saw another, much more evasive coyote later on the trip, I decided to look up coyote medicine. There are many facets to coyote but the one I liked is about multi-tasking. As we edge up on the end of the year, I always start to think about where I am and where I'm going and, as usual, I start to wonder if I should be more focused. I tend to take on a multitude of projects which means I never quite develop the mastery that I would like to have in any of them. Turns out that the curiosity of coyote nature makes it natural to have many projects going on simultaneously. Accepting this tendency toward many projects, yet developing the discipline needed to finish the projects is a way of accepting the nature of coyote. That seems like a good plan. So beautiful an animal this one is. Fascinating. My son's power animal is the raven. Love that photo! Would be great framed!! I love winter in Yosemite, it's so empty and peaceful, not to mention the beauty of the snow. I want to do Bracebridge again when my kids are older.